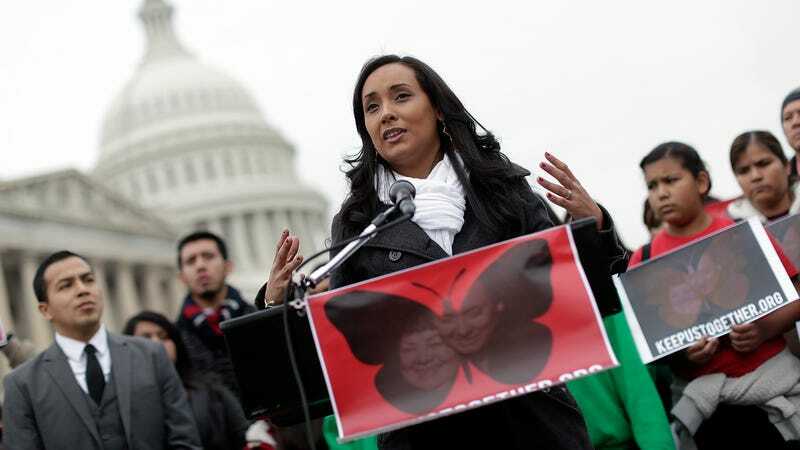 Erika Andiola speaking at a press conference held by the Dream Action Coalition on immigration reform December 4, 2013. Image via Getty. According to her Twitter account, Erika Andiola–former press secretary for Bernie Sanders and a DACA recipient–was arrested on Friday evening along with six other Dreamers and one ally after sit-ins at Senator Chuck Schumer and Representative Carlos Curbelo’s offices. (Their arrests are captured on video here). They are on hunger strike and are prepared to stay in prison until Senator Schumer and Representative Curbelo “publicly confirm they have the votes to block any spending bill without a Clean DREAM Act.” They are demanding that a Clean DREAM Act be passed on December 22nd, the deadline for the federal government to pass spending legislation in order to avoid a shutdown. They call themselves the #Dream7. Andiola, an undocumented immigrant, has told Teen Vogue that she immigrated to Arizona at the age of 11, when her mother brought four of her siblings from Mexico to escape poverty and domestic violence. While Andiola was in college, the family home was raided, her mother lost her job, and at one point her mother and brother were arrested by ICE agents and nearly deported; her tearful, heart-wrenching reaction on YouTube became a widely-reported story. Speaking on behalf of Andiola, Candice Fortin has said that they were arrested for overstaying building hours, which was deemed unlawful entry. She says that neither Schumer nor Curbelo were in their offices at the time. Fortin says that they have refused to provide names and fingerprints in order to stay in prison, and they will be brought before a judge on Tuesday morning. Jezebel has reached out to the Washington D.C. Department of Corrections, Senator Schumer and Representative Curbelo’s offices, and we will update the post if we hear back.